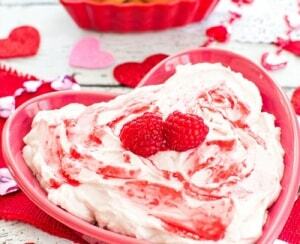 Are you looking for an easy Valentine’s Day dessert? This white chocolate raspberry cheesecake dip recipe combines the sweetness of white chocolate with fresh raspberries to create a light and fluffy dessert dip. Place raspberries into a blender and blend into a puree. Then run the puree through a fine mesh strainer to remove the seeds. Use the back of a spoon to press the mixture through the strainer to help get more juice through. Set aside. Melt white chocolate using your preferred method and let cool. See note below. In a small bowl, beat the heavy whipping cream until soft peaks form. Set aside. Using a mixer on medium speed, mix the cream cheese until smooth. Add in vanilla and slowly add in powdered sugar. Mix until combined. Fold in melted white chocolate and whipped cream. Reserve about a 1/2 tbsp of the raspberry puree to drizzle on top of the dip and mix the remaining puree into the dip. Chill for an hour in the refrigerator. Serve with fresh fruit, vanilla wafers, or graham crackers.